Lab 7: Nitrates and Phosphates and Algae, Oh My! EarthLabs for Educators > Fisheries > Lab 7: Nitrates and Phosphates and Algae, Oh My! Human-induced nutrient loading of the world's oceans has been linked to increased and prolonged algae blooms, sometimes with potentially deadly consequences. In this investigation, students will create their own algal blooms, analyze satellite images of chlorophyll concentrations in the Sea of Cortés, and learn about two alarming consequences of excessive algae growthdead zones and harmful algae blooms (HABs). explain the potentially harmful consequences of algal blooms including dead zones. 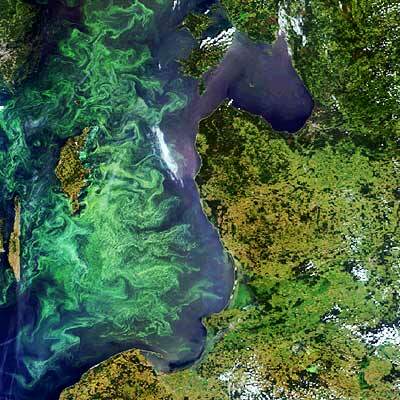 A colorful summer marine phytoplankton bloom fills much of the Baltic Sea. Photo courtesy of European Space Agency. In the previous investigation, Aquaculture, students learned that one of the drawbacks of coastal aquaculture facilities is the transfer of additional waste and nutrients to the surrounding water. In this investigation, students learn about other ways in which humans are increasing the nutrient content of coastal waters and about the ensuing consequences for land and sea. The investigation requires laboratory space and equipment, which should be procured ahead of time. For the laboratory portion of the investigation, students should be assigned to small groups of 3-5 students. In Part B, students use images and data from the Sea-viewing Wide Field-of-view Sensor (SeaWiFS) Project, to look for correlations between phytoplankton blooms in the Sea of Cortés and the addition of nutrients through agricultural runoff from the surrounding land. Students create a time-series animation of chlorophyll concentration over a two-year tie period. They also generate an area-averaged chlorophyll concentration data plot showing the average chlorophyll concentration in the Sea over the same two year time period. Both visualizations are produced using Giovanni Ocean Color Time-Series Online Visualization and Analysis Tool. The Giovanni tool requires the Java 2 Platform. For more detailed information about Giovanni's compatibility with your computer's operating system and internet browser, go to the Goddard Earth Sciences Data and Information Services Center website. A non-Java version is also available. Students conclude Part B by reading the article Researchers discover direct link between agricultural runoff and massive algal blooms in the sea, which explains the connections between the algal blooms observed in the satellite data and agricultural runoff from Mexico's Yaqui Valley. In Part C, students learn about dead zones and harmful algae blooms (HABs). They first look at the graphic Birth of a Dead Zone from Part 1 of the L.A. Times Series, Altered Oceans. They then read the Earth Policy Institute article, Dead Zones Increasing in World's Coastal Waters. To view the Altered Oceans multimedia graphics, student computers need to be equipped with the Adobe Flash Player. The final portion of this investigation introduces students to HABs. They revisit the Altered Oceans series to view the graphic Harmful algae blooms and their consequences and read the story Dark Tides, Ill Winds. Be sure to dispose of algal cultures responsibly. Do not allow students to pour cultures down the drain without treating them first. To prepare cultures for safe disposal, do one of the following. (1) Add bleach to the culture to make a 1% solution. Leave the bleached cultures to sit overnight and then pour down the drain with running water. (2) Bring the cultures to a boil in a microwave-safe container in a microwave oven. Although this may be accompanied by an unpleasant smell, it will not contaminate your microwave or make it unsafe for future food preparation. Use more than one species of algae (grown separately) to compare the growth of different species under similar conditions. Add treatments to test the effect of temperature or salinity on algal growth. Create graphs of final cell density versus temperature or salinity. Because the story Dark Tides, Ill Winds in Part C is a bit long, you may choose to assign the reading and subsequent Checking In and Stop and Think questions for homework. For background information about algal blooms, read the Wikipedia entry: Algal Blooms. For background information about dead zones, read the Wikipedia entry: Dead Zone (ecology). For background information about harmful algae blooms, visit The Harmful Algae Page, supported by a National Oceanic and Atmospheric Administration Center for Sponsored Coastal Ocean Research Coastal Ocean Program (NOAA/CSCOR/COP) grant. Eutrophication and dead zones also occur in bodies of fresh water such as Lake Erie. Check out the Environmental Protection Agency's informational page on the Lake Erie Dead Zone. Although the addition of fertilizer to the world's oceans is typically unintentional, some scientists believe that deliberate addition of certain types of fertilizer may help combat global warming. For more information about this topic, read the Science Daily article Marine Researchers Fertilize Southern Ocean To Study Climate Changes. Lab 1: Plenty of Fish in the Sea? Lab 2: Are You Going to Eat That? Lab 4: To Fish or Not to Fish?